When we in Melbourne last weekend for Frocktails a few of the Melbourne ladies were lovely enough to chauffeur a few of the out-of-towners around to some Melbourne fabric shops. 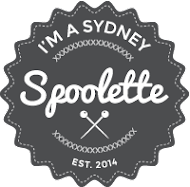 I was very excited to tag along as I strongly strongly believe (very strongly) that Melbourne's fabric shopping game sh!ts all over Sydney's. Melbourne seems to HAVE so many great fabric shops. We visited Rathdowne, Darn Cheap Fabrics and the Cloth Shop at Ivanhoe. It was at the famed Darn Cheap Fabric were I picked 2.5m of the fabric below, initially ear-marked for a Lady Skater Dress, but when I got it home I thought perhaps a cardigan might be better for this slightly thicker cotton/poly/spandex mix. The fabric is sort of quilted...with material on the front and back that are stuck together somehow. It's quite cozy and feels lovely to wear. 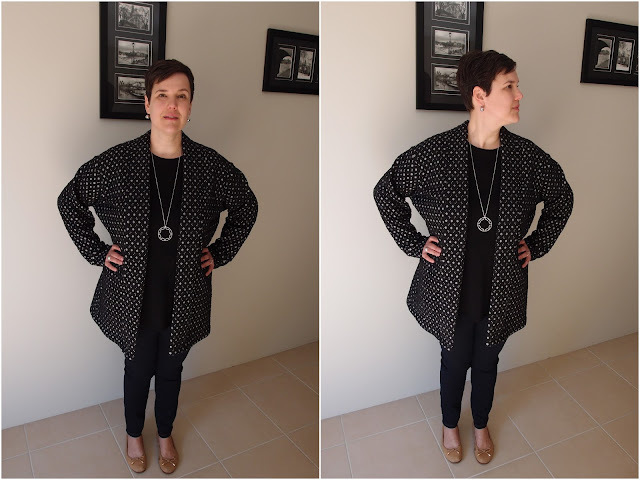 The Oslo Cardigan is one of the first patterns from Colette's Seamwork Magazine. I don't pay for a magazine subscription (if you do the patterns are free) so this pattern cost me about $6 - pretty cheap really. I bought the pattern AGES ago but bulked at putting the PDF together as it's about 1000 pages long. Like the Colette PDF patterns the page margins are 1" on each side which seems a bit...wasteful. I was sick all of last week however so had plenty of time to stick this thing together *grumble grumble*. 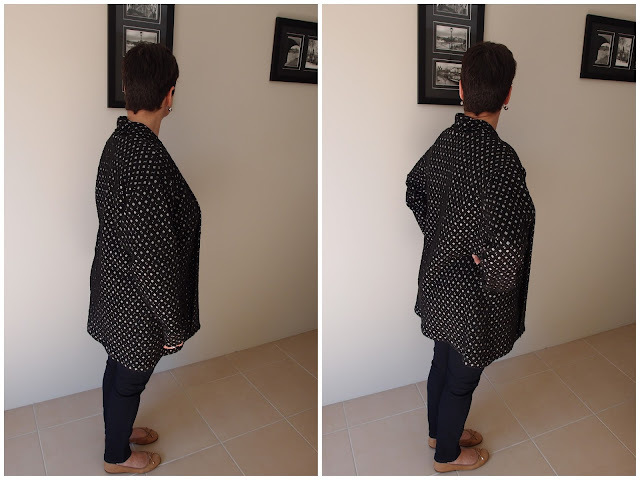 The pattern is an "oversized" cardigan with sleeve cuffs and a collar that goes the entire way from hem to hem. 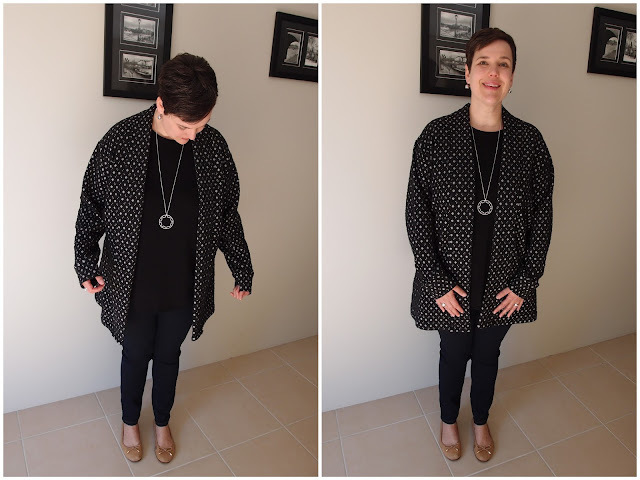 I sewed a size XL leaving the length at the 3XL as I'm tall-ish so didn't want a short short cardigan to wear with skinny pants. It fits as expected (it fits = YAY) although I am wondering if I could size down next time...the only thing stopping me is that there is quite a big difference between each size - so going down just one size could make it too small. There's not much to say about this make really. I read through the instructions before starting and referred to them again only when it came to attaching the collar - just to make sure I was getting things right. 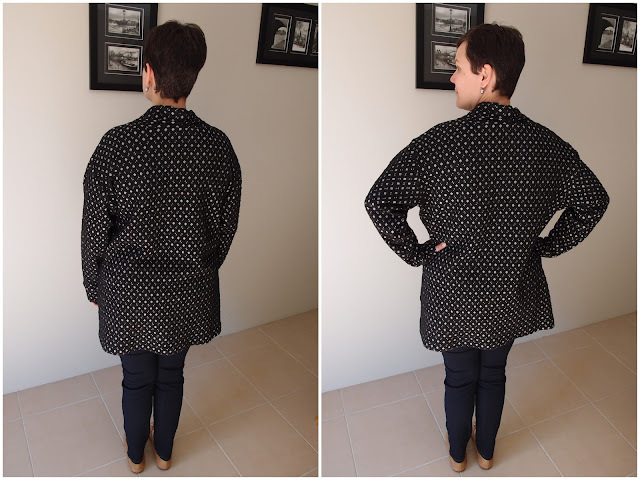 It was a very easy garment to sew and (for a change) I had no machine troubles so everything went swimmingly. The pattern piece for the cuff was ridiculously long so I decided to half the length of the cuff, and even then the sleeve is still too long for my liking, but I guess that goes along with the whole "oversize" thing the Oslo has going on. Next time I will stick with my shorter cuff, but take about 1" off the sleeve piece. 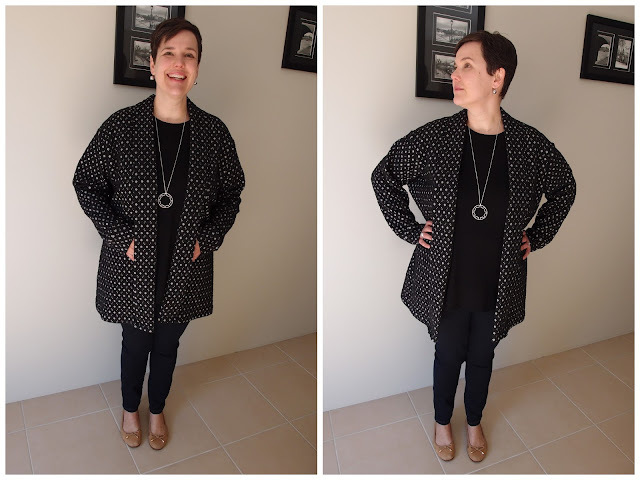 The only other change I made to the pattern was to tack down the collar piece as it would not sit flat due to the bulkiness of the fabric and it was making me feel a bit messy and swamped by the garment. I put in a few machine stitches at each hem and at the back of the collar to stop it flipping up and standing at attention. I feel a lot more tidy in this cardigan now and less swapped by how big it is. 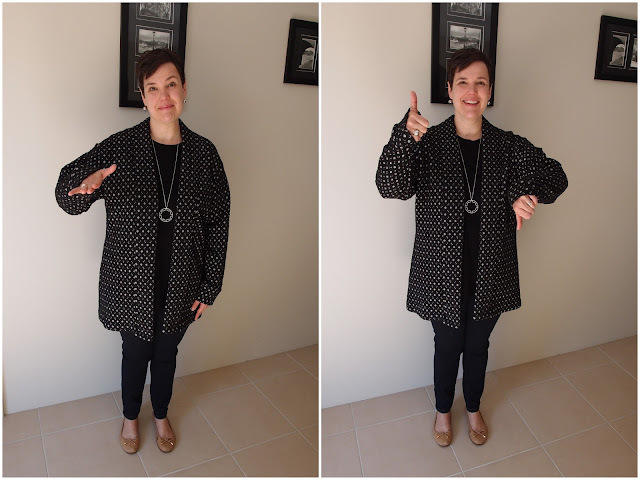 Just gotta say though that this cardigan desperately needs pockets -- how would I go about that doing you think - robbing the pockets from the Tessuti Jacket perhaps? Back view...just for kicks. 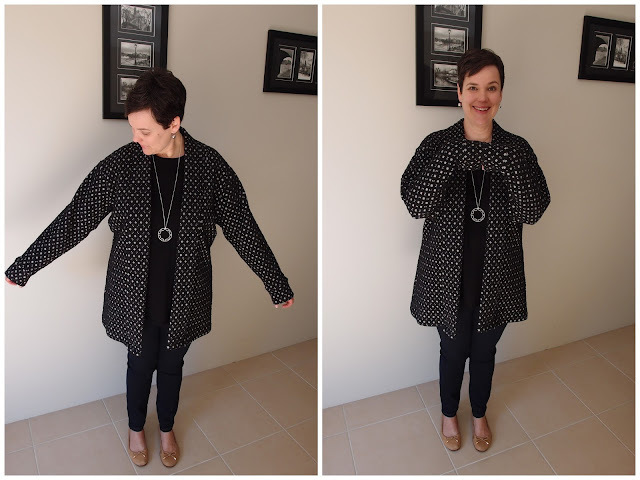 I think the cardigan does look big in this photo, but again that is the style and in a more drapey, snuggly fabric I think it would be OK? Still cannot decide if should size down or not? Modifications: reduced the length of the cuff by half; stitched down the collar at the hem and back neckline to stop it flipping up.